Myositis is a disease in which inflammation occurs in muscles and in other organs. “Myositis” means muscle inflammation. There are few conditions under its umbrella: polymyositis, dermatomyositis, juvenile poly-/dermatomyositis, myositis secondary to other conditions (cancer) and myositis related to other rheumatic diseases (for example, lupus or scleroderma). The cause of the myositis is aunknown. There are immune system abnormalities that play role. These are rare disorders, affecting only about 1 in 100,000 people per year. More women than men are affected. Although the peak age of onset is in the 50s, the disorders can occur at any age. The main symptom that is common to the inflammatory myopathies is muscle weakness although other symptoms can occur. Muscle weakness: typically patients develop painless weakness of the upper arms, thighs, neck, and trunk (so called, proximal weakness). Patients may notice difficulty rising from a chair, climbing stairs, or reaching up to a high shelf while grip strength remains normal. At times there may be mild muscle soreness. The onset is usually gradual. Some patients will develop difficulty swallowing or may aspirate food into the lungs. Gottron’s sign is a flat red rash over the back of the fingers, elbows or knees. 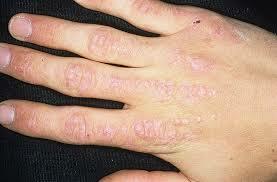 Gottron’s papules are red, often scaly, bumps overlying the knuckles of the fingers. The shawl sign is a reddened area on the upper back, shoulders, and back of the neck. It can worsen with exposure to ultraviolet light. The V sign is similar to the shawl sign but appears on the front of the chest, in the area of skin exposed by a V-necked sweater. 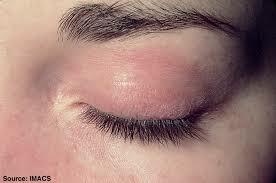 The heliotrope rash is located on the upper eyelids and is often accompanied by eyelid swelling. 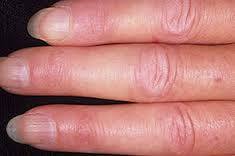 The skin around the fingernails may become red. “Mechanic’s hands,” a roughening and cracking of the skin of the tips and sides of the fingers, resembling those of a manual laborer. Changes in the scalp resembling psoriasis often occur in people with dermatomyositis. Lung disease: patients may develop a cough and shortness of breath with exertion that ranges from mild symptoms to severe. Antisynthetase syndrome: those patients have antibodies in their blood termed the anti-synthetase antibodies. Anti-Jo-1 antibody is the most common. This subgroup is characterized by rashes (mechanic’s hands), lung disease, fever, arthritis, and Raynaud’s phenomenon (fingers turning white on cold exposure) in addition to muscle disease. Other systemic rheumatic diseases: when myositis accompanies scleroderma or systemic lupus, the myositis does not always cause symptoms. Some people have mild muscle weakness, while others have only abnormal blood muscle enzymes to indicate the presence of the disease. Cancer: people with myositis, especially adults with dermatomyositis, have an increased risk of cancer. This risk increases with age and involves the same common cancers that affect the general population, including cancer of the lung, breast, prostate, and ovaries. As a result, people with dermatomyositis may need more frequent cancer screening. Diagnosis — The diagnosis of myositis involves a careful history, a thorough physical exam, and some blood tests. People who have these conditions often have muscle weakness and/or typical skin changes, and blood tests showing evidence of muscle damage or the presence of antibody markers. Nearly all patients with myositis will have elevation of creatine kinase (abbreviated “CK”) levels. Many will have antinuclear antibodies (ANA) or one of the anti-synthetase antibodies in their blood. Some myositis patients may have no antibody markers. In patients in whom it is difficult to determine the cause of muscle weakness, other tests may be useful. An MRI scan of the muscles can demonstrate changes suggesting muscle inflammation, while an electromyogram (EMG) can demonstrate abnormal electrical activity in muscles, indicating muscle injury. An EMG is usually performed by a neurologist and involves inserting small needles into muscles, usually of the arms or legs, and recording the electrical potentials generated by the muscle. EMG testing can help distinguish weakness due to muscle disease from weakness due to nerve problems. A muscle biopsy is a procedure that removes a small piece of muscle through an incision in the skin. The specimen is prepared with special stains and a physician examines it under microscope. Muscle biopsy is the most accurate test to diagnose dermatomyositis or polymyositis but may not be necessary to establish the diagnosis in cases with typical muscle weakness/elevated CK and characteristic rash. Drugs: statins, used to treat elevated cholesterol; prednisone in high and prolonged doses; or colchicine. Muscular dystrophies, which have specific patterns of weakness and may be familial. Metabolic myopathies: rare conditions due to abnormalities in special enzymes. Electrolyte abnormalities: severe potassium loss. Inclusion body myositis: rare disease that most often affects older men and causes slowly progressive weakness that tends to involve muscles in the hands and arms/thighs as well. This disease is diagnosed by muscle biopsy. Treatment — Treatment myositis is usually initiated with prednisone. Prednisone is a form of cortisone that in high doses is a very effective anti-inflammatory drug. In patients treated with prednisone, muscle enzyme levels will begin to fall in a few weeks and muscle strength usually recovers within a few months. Unfortunately, high-dose prednisone can also cause numerous side effects. For this reason, it is important to use the lowest dose for the shortest time that controls the disease. Methotrexate or azathioprine are usually added in the treatment course in order to minimize the use of prednisone. While these medications do have some side effects, they are often effective in controlling the disease long term and they can be used safely in the vast majority of patients. For those patients who are resistant to treatment with azathioprine or methotrexate , other options include a combination of both methotrexate and azathioprine, intravenous immunoglobulin, mycophenolate or rituximab. Plaquenil is often effective in the treatment of dermatomyositis rashes. Since polymyositis and dermatomyositis cannot be cured but can be controlled by medications, it is important for patients to be monitored long term for signs of disease relapse. Patients need to have their CK level and muscle strength tested on a regular basis. Osteoporosis prevention: calcium, vitamin D and the bisphosphonates use in patients treated with prednisone. Exercise: physical therapy and rehabilitation to prevent muscle contractures. 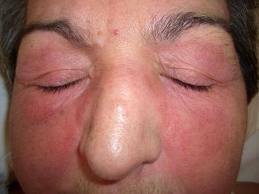 Avoidance of sunlight: the rash of dermatomyositis is often worsened by sun exposure (use of sunblock). Aspiration prevention: elevating the head of the bed, adding thickening agents to drinks, or, in severe cases, by having a feeding tube placed in the stomach. The severity of disease in a person with dermatomyositis or polymyositis can range from mild weakness that responds well to treatment to severe disease unresponsive to all treatments. People with dermatomyositis or polymyositis tend to have a better outcome if treatment started early, have mild muscle weakness, have no difficulty swallowing, and have no signs of disease in other organ systems such as the heart and lungs.